Mark Waid and Chris Samnee have been doing fantastic things with Daredevil for a number of years at this point, but the end of their time is approaching, as it was recently announced that comic writer and actual lawyer Charles Soule will be taking over the writing duties (with Ron Garney on art) with the post-Secret Wars launch of Daredevil for “All-New All-Different Marvel.” So things on Waid and Samnee’s run of the series seem to be intensifying in preparation for their final story, and Daredevil #16 certainly builds in much tension. The big draw of Daredevil #16 is the return of the Kingpin, Wilson Fisk, who has for some reason relocated to San Francisco as well (the issue implies Spider-Man forced him out of NYC). Waid has not been using Fisk at all during his run quite intentionally, but every DD writer probably has to do at least one story with Matt Murdock facing off against Fisk. Here, it’s a negotiation with Murdock offering his own identity (which used to be Fisk’s prize, back when only he knew Murdock was Daredevil) in exchange for making the mess caused by The Owl and The Shroud in Daredevil #15 go away. Fisk is playing another game, though, by recruiting Ikari, a fierce villain created by Waid and Samnee earlier in their run. For an issue that features relatively little action, it’s a really intense and compelling comic book. Daredevil #16 showcases why, after all these years, Murdock and Fisk are still quite equal matches for each other, even though they are quite different. Matt’s offer, which is essentially to change his name (telling the world that Matt Murdock is dead) and get plastic surgery on his face is quite extreme. It’s hard to tell if he is bluffing or if the threat from The Owl/The Shroud is that scary. Still, the scenes between Fisk and Murdock are dramatically rich, with strong art and effective dialog. 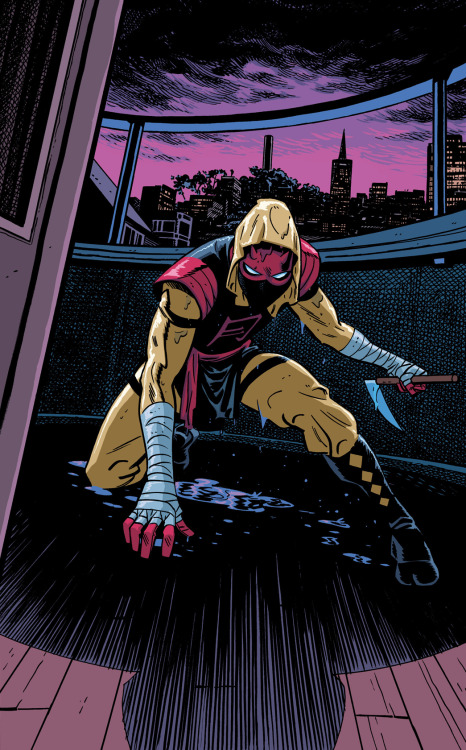 It’s also fun to see the return of Ikari, who is one of the best new villains to come to Daredevil in years. During their previous fight, Daredevil was nearly killed. For the most part Ikari is a hired gun. There are perhaps no guns more dangerous, though, than those hired by Wilson Fisk. In other words, the team-up of Fisk and Ikari on one front while The Owl controlled by The Shroud (and seemingly assisted by Jubula Pride) on the other really illustrates how high Waid and Samnee are raising the stakes in their last stories. Speaking of illustration, Daredevil #16 gives us a different side of Chris Samnee. 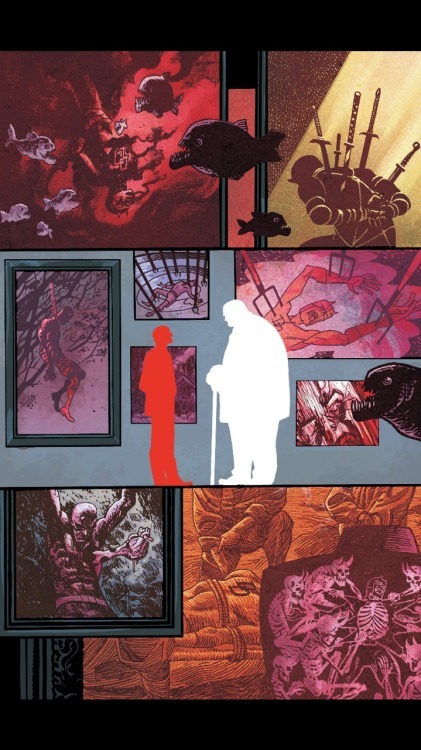 While his drawing style isn’t especially changed from previous issues of Daredevil, it is the compositions that are different. Samnee’s style usually pops, but the confrontation between Fisk and Murdock is muted and tension-filled. Samnee intensifies the dramatic tension by showing the audience something Daredevil can’t see (since he can’t see paintings) – a room full of paintings that Fisk has commissioned of Daredevil being killed in tortuous and rather Hieronymus Bosch-like styles. It’s creepy and adds a ton of mood to the scene. Daredevil #17 is billed as “The Finale, Part 1,” meaning there may only be a few issues left of Waid and Samnee, which have been one of the best creative teams ever on Daredevil, a book blessed with some great creators through the years. So Daredevil #16 works very well as a pen-penultimate chapter. It revisits the long struggle between Kingpin and Daredevil while also setting up the difficult-to-predict ending of this particular story.